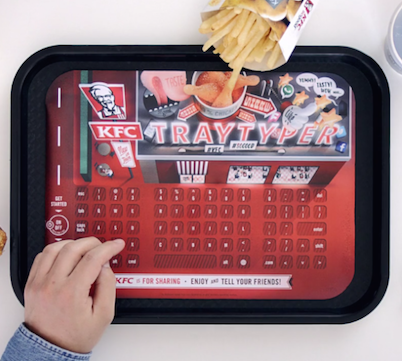 KFC now offering an excellent innovation "TRAYTYPER" which helps you to type your message or chat with your friends and family while you finger licking chicken. Most of the people update their status on Facebook when they having lunch or dinner and using your smartphone at that moment will leave your shiny display covered in oil and sauce's, but thanks to KFC's new Tray pad which let you text, tweet and even get stuff done dinner without having to touch your smartphone display. The Try Typer measures just 0.4mm thin, has a rechargeable battery built-in, and connects to almost any modern smartphone, tablet or laptop wirelessly. It's also Bluetooth enables so that you can type wireless. Simply power on the TrayTyper and pair with your smartphone before you start your meal. And you can enjoy your KFC chicken and chatting or updating status on social sites via TrayTyper.